Happy New Year! It is the time of year when many of us are thinking about making resolutions. The most common resolutions for people can also apply to your pet. 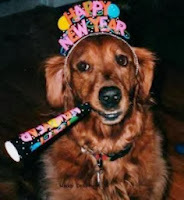 So, as you begin your planning, be sure to include your pets and make 2014 the best year for both of you. Just like people, good nutrition for your pet is the key to good health. Often a poor diet is responsible for health problems including obesity and associated diseases, skin and coat problems, and allergies. Giving your pet a well balanced, age appropriate diet will help ensure a happy, healthy pet. It is also important that the quantity of food that you give matches the life stage and activity level of your pet. Click here to learn more about what to look for in a good diet for your cat or dog. Regular exercise is important to keep your pet in good physical shape and reduce the risk of obesity. It also reduces the risk of heart and joint problems. It can be as simple as a daily walk or can be more strenuous depending on your pets physical condition. Exercise is a great way to bond with your pet and as an added benefit, an exhausted dog is less likely to engage in destructive behaviors. To exercise a cat, you could play with them, making them chase a feather or string. Regular grooming including, bathing, coat maintenance,toe nail clips, and teeth brushing (or non-anesthetic cleanings). They are not just to help your pet look good, but are important to their overall health. Yes, no one likes a smelly dog or enduring “cat breath” , but they could be an indicator of an underlying medical condition. If the problem does not resolve with regular grooming, please seek assistance from your veterinarian. A visit to your veterinarian regularly is a good way to stay ahead of any potential problems. Preventive care is much less expensive than waiting to deal with a major illness or condition and it can also save your pet from suffering. Annual laboratory tests for all pets (even young pets) provides a “baseline” which can be invaluable. Learn more about pet health conditions. Keeping pets safe is something most pet owners take for granted, but there could be hazards lurking everywhere. Take the time to make precautions in your home and yard. Analyze what toxic substance your pet could gain access to and what chemicals are used in the area your pets reside. Also include an assessment of physical hazards such as fencing, choking hazards, swimming pools and anything that they could get caught on or fall from. Life gets busy and all too often, our pets take a backseat to other demands. Try to make time for your pet---quality can be more important than quantity. Sometimes a neighbor or family friend may be eager to help you care for your pet and pet sitters can fill in for you on a long day. Many doggie playcare places are affordable and can take the stress off of you if you are working long hours.